Add the pork to the pan while still cold. Turn the heat up to medium and allow to start cooking and rendering out the fat. Allow the bacon to cook for about 2 minutes before turning over and cooking the other side. Once perfectly cooked and brown remove the bacon and add the onions with the olive oil and butter. Season with salt to taste. Cook the onions until completely soft. This should take about 15 minutes. Add the garlic and thyme and cook for another 1 minute with the bacon, allowing the garlic to cook. Stir the cooked mixture through the cheese sauce and toss with the cooked pasta. Add the pasta mixture to an oven proof dish. Combine the breadcrumbs with the tomato pesto and Italian herb mix. 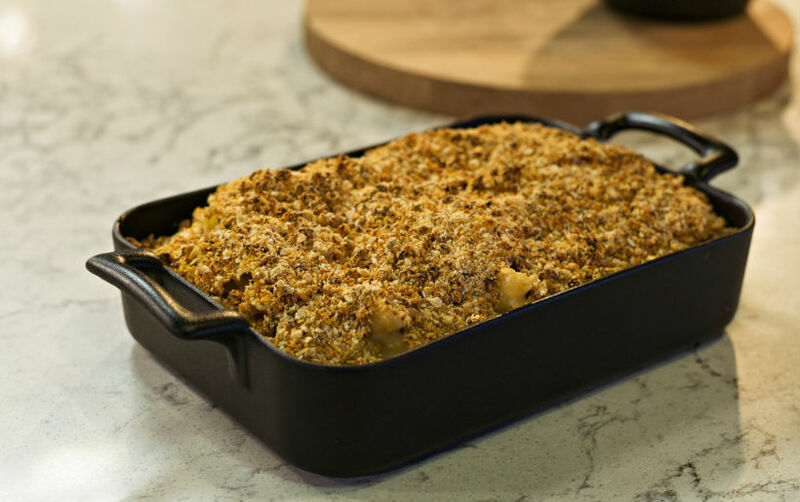 Sprinkle the breadcrumbs over the pasta before placing in the oven to bake for 30 -35 minutes or until the topping is golden and crisp and the mac’n’cheese is bubbling away.